Along with energy balls, I’ve always had a thing for meatballs. There’s just something about the flavour packed into those little balls that is so crave-worthy. On a typical night, I usually stick to basic beef or chicken meatballs mixed with a marinara sauce. But every once in a while, I like to mix it up. 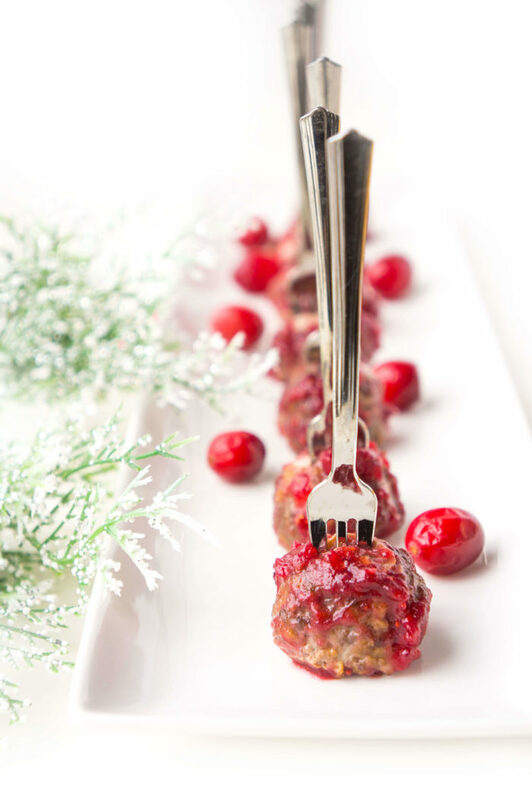 In light of the holiday season, I decided that I wanted to experiment with some cranberry meatballs, because number one, they sounded absolutely delicious, and number two, they’re so pretty to serve up with their ruby red hue. 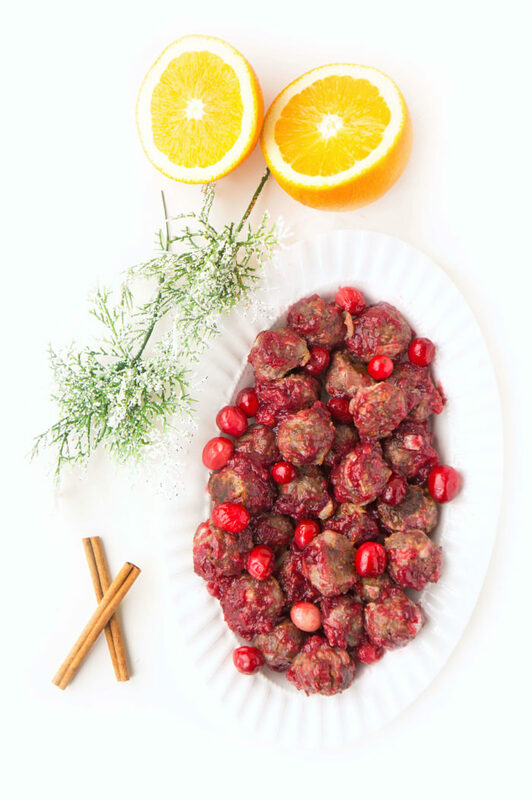 I started my cranberry meatball experiment by coming up with a homemade cranberry sauce and using one of my favourite beef meatball recipes. I thought it would be sufficient to just add the meatballs to the cranberry sauce and call it a day, but I found that something was lacking. It’s almost like the cranberry sauce was too tart on its own. When I made up a batch of these meatballs the next time around, I added some chilli and sriracha sauce to the mix to incorporate a little bit of spice. I also used ground chicken instead of the beef and with the combination of those changes, the recipe turned out so much better. You can really use beef or chicken, but I think it’s the sauce that made the difference. It had a sweet and smoky taste to it with a slight kick of heat. Just the flavour I was going for. 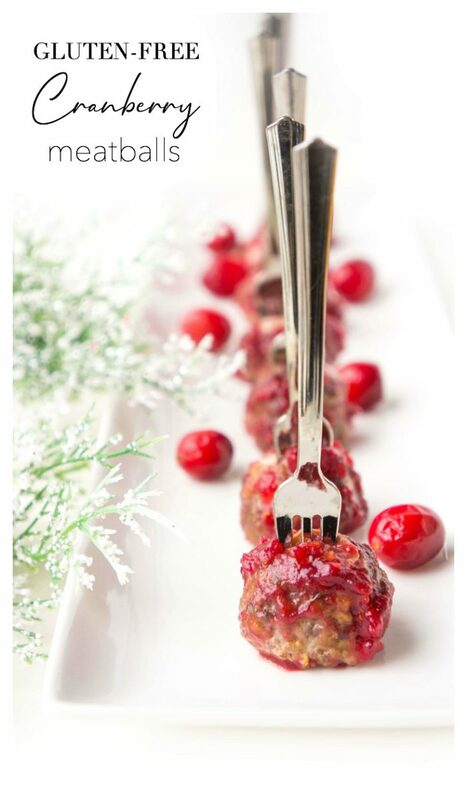 You could serve these cranberry meatballs up as an appetizer in the form of cocktail meatballs with cute little forks or toothpicks, or you could make them more into a meal and serve them along with rice (or insert other side of choice). 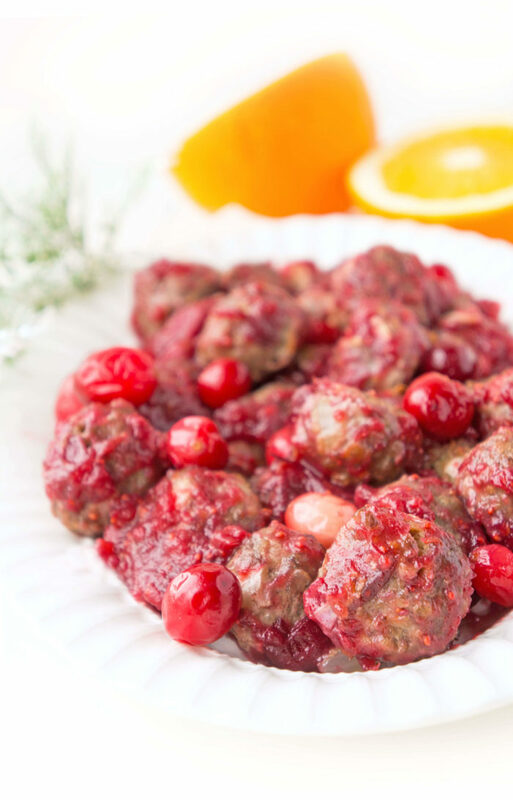 Overall, they’re much healthier than buying store bought meatballs and cranberry sauce because you can control exactly what goes into them. Watching your sugar intake? Reduce the honey used in the cranberry sauce. Watching your sodium? Reduce the salt used in the meatballs. Looking to reduce your saturated fat intake? Use an extra lean ground beef or chicken. 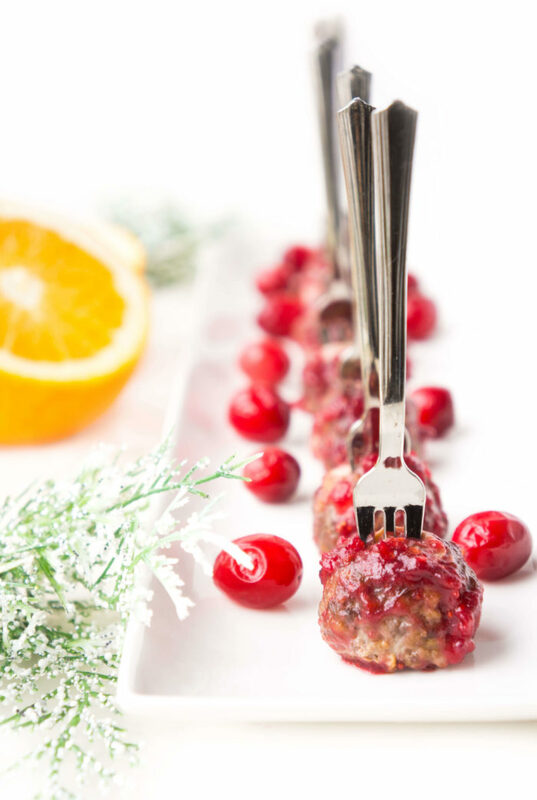 So many ways to adapt these cranberry meatballs based on your nutritional needs, and they’re just as tasty (if not more!) than store-bought. That’s my kind of meatballs! Preheat oven to 400ºF. Spray a large baking sheet with cooking spray. In a large mixing bowl, mix together ground chicken, onion powder, almond flour, garlic, egg, worcheshire sauce, salt, pepper and parsley in a large mixing bowl, being careful not to overwork the mixture. Form into 1-inch balls and place on prepared baking sheet. Bake in oven for 20-25 minutes, or until meatballs are browned and cooked through. While the meatballs are baking, whisk together orange juice and honey in a small saucepan over medium heat until the honey dissolves. Add cranberries and cook for about 10 minutes, until the berries soften, then reduce heat and add chili sauce, orange zest and sriracha, cooking an additional 10 to 15 minutes. You may wish to mash the cranberries with the back of a wooden spoon to achieve a jam-like consistency. 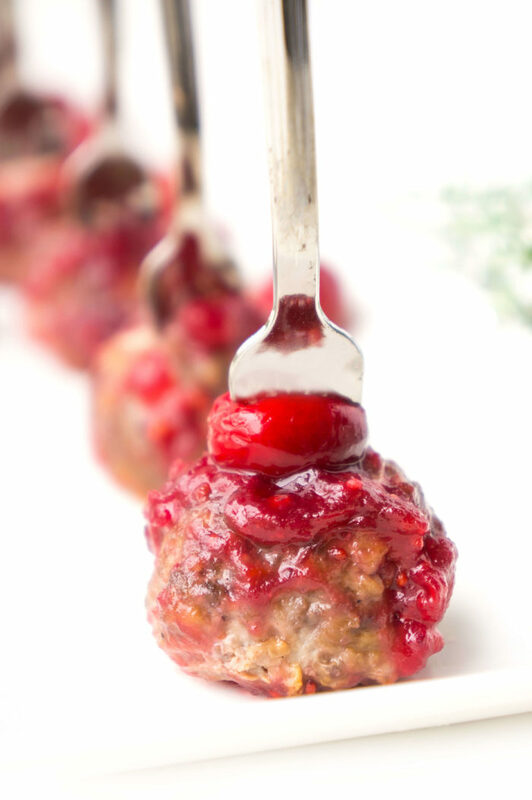 Remove cranberry sauce from heat and season with salt and pepper as needed. Toss sauce with baked meatballs, garnish with fresh parsley and enjoy! Looking for some other festive recipes? Check these out!